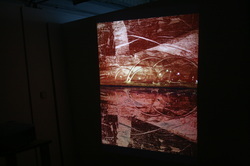 Transient Capsules, culminated in capturing the flow of soap, water and ink on video where the projected recording itself forms another ephemeral element of the transient media. A central concept is the transcendent nature of space, stemming from the corporeal to a subsequent array of relative existential and cerebral parallels. Copyright © 2011 by Josh Gibbs. All rights reserved.